Bas van Dorp emailed me a picture of his Seiko Monster. He wore it during his snowboard trip. 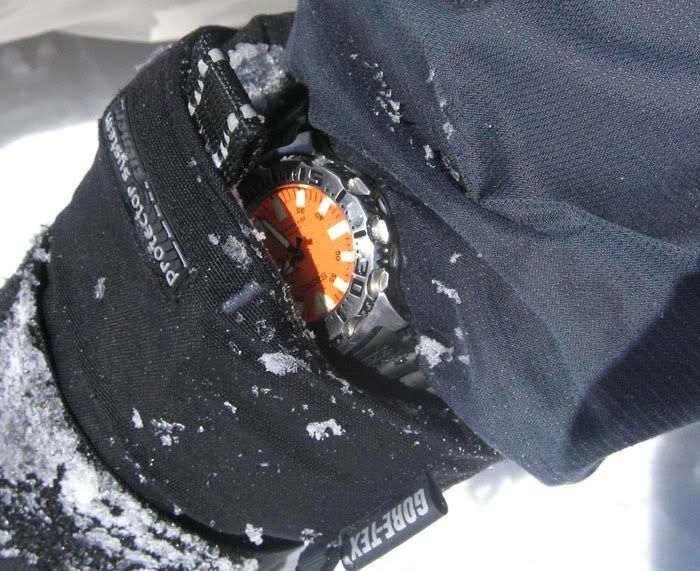 As you can see, this Seiko Monster is like the Speedmaster Professional with NASA astronauts, worn on top of the (ski) jacket! The large orange dial makes it very easy to read while being in full action! Seiko model: SKX781 K3, a.k.a. Seiko Monster, caliber 7S26 (automatic movement with day-date feature). Water resistant to 200 meters (660 ft). Stainless steel case with a diameter of 41mm (height: 12mm). Just google on ‘Seiko Monster’ and you will find plenty of online dealers who sell this watch for a very reasonable price. The ski jacket is a Lowe Alpine and the gloves are by Ziener.